Do you want to strengthen your immune system? Then load up on your antioxidants! It is a known fact that adding more fruit and veggies to your diet will improve your health, but some foods are higher in antioxidants than others. The 3 major antioxidant vitamins are beta-carotene, vitamin C, and vitamin E. You’ll find them in colorful fruits and vegetables, especially those with purple, blue, red, orange and yellow hues. To get the biggest benefits of antioxidants, eat these foods raw or lightly steamed (blanch); don’t overcook or boil. So, why shouldn’t you over-steam or boil your veggies? The enzymes and nutrients in your vegetables are destroyed when they reach 100 degrees, so you are not getting the most out of your veggies. Steaming can release just as many nutrients as boiling, the water will still absorb just as many vitamins and minerals. Have you ever steamed a green vegetable only to find that your water is green? Blanching your vegetables is a good way to ensure you keep your vegetables crisp, bright in color, and full of nutrients. Blanching is very different than boiling. Your vegetables are placed in simmering salted water for about a minute. This is a method of flash cooking that barely cooks your vegetables. 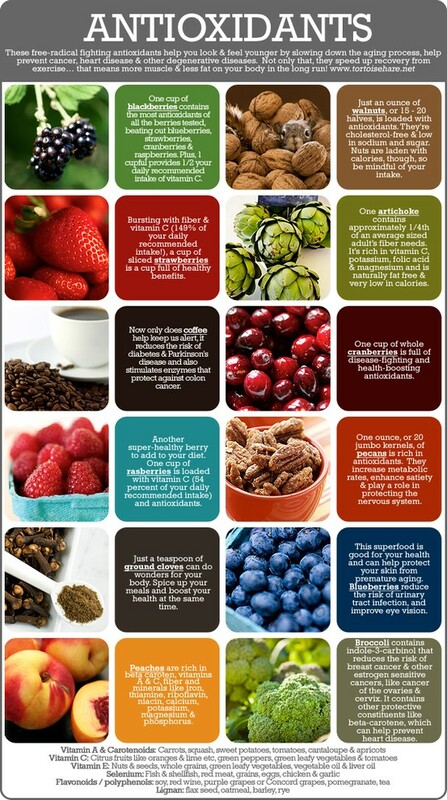 Below is a nifty table with photos of some of the major antioxidant food sources. Where is the meat on this chart? When discussing how to improve health, I don’t ever hear that we need to incorporate more beef. As I mentioned earlier, we all know more fruits and vegetables are what we need to be healthier.